The Islamic Research and Training Institute (IRTI) of the Islamic Development Bank (IsDB) Group today released an Islamic Finance country report on the Republic of Djibouti, which analyses the country’s Islamic financial outlook and identifies opportunities in the sector. The report was launched during the 14th IsDB Global Forum on Islamic Finance, attended by the IsDB President, Dr. Bandar Hajjar, and Governor of Djibouti Central Bank, Mr. Ahmed Osman, on the sidelines of the 44th IsDB Group Annual Meeting in Marrakech, Morocco. Djibouti introduced Islamic banking in 2006 with the establishment of an Islamic bank branch, and since then Islamic Finance spread quickly. 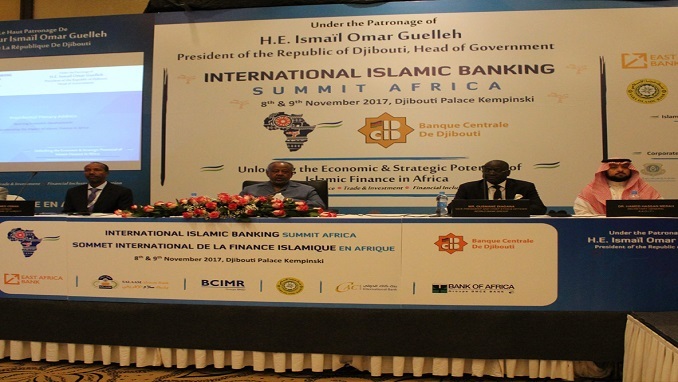 The report finds that three full-fledged Islamic banks are at present operational in Djibouti, and Islamic banking constitutes about 17 percent of the total banking industry assets. In light of the remarkable progress recorded so far by Djibouti, the report recommends a re-design of the institutional framework governing Islamic Finance, developing a national strategy to enhance human capacity, and undertaking stronger public sensitization on Islamic Finance. The report also identifies potential opportunities for Djibouti in Islamic Financial sectors other than banking, such as the development of Takāful industry, which could benefit from the positive attitude of the population towards Islamic finance and which could also complement the rapid development of Islamic banking. Moreover, the report notes that Djibouti, with a history of trade, and with more than 90 percent of the population being Muslim, is an ideal place to develop a center for halal industry in the region. Sukuk is another area that Djibouti could leverage on to complement resource mobilization efforts for investment in the Sustainable Development Goals (SDGs). The report points out, however, that the enabling regulatory framework needs to be formulated to enable the country tap the potentials of Sukuk. “This will ultimately help in addressing the infrastructure funding gap, reducing external borrowing, creating jobs, reducing poverty, and increasing Djibouti’s ease of doing business,” the report adds. Djibouti Islamic Finance Country Report is the 10th in the Islamic Finance Country Report (IFCR) series first initiated in 2013 by IRTI and other strategic partners. IFRCs are aimed to provide analysis on the Islamic financial outlook of countries, including regulatory environment and market analysis, for the benefit of prospective investors and other stakeholders. The other previously published IFCRs covered Morocco, Oman, Tunisia, Turkey, Sudan, Malaysia, Indonesia, Kazakhstan and Pakistan.